This Concord 4 berth Motorhome is perfect for the couple who are looking for a little extra room or up to 4 people with the ability of having 2 x large double beds or 1 double and 2 x singles. Based on the powerful 2013 Ford Transit style and comfort giving you the ultimate motorhome experience. This vehicle is certified self contained. 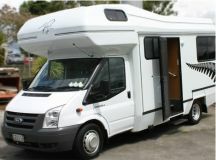 Top quality, 2010 Ford Transit 2 berth motorhome. Easy to drive, with power steering, the Motorhome handles like a car, is practical, comfortable, and well appointed. An ideal way for 2 people to travel the country in comfort and style. This vehicle is certified self contained and ideal for freedom camping. The Kiwi Cheviot 4 Berth is a great vehicle for a family of up to 4, or a couple who want extra space. The motorhome is a 2014 model Ford Transit all powered by an economical powerful 2.4L turbo diesel engine. Maximum of 2 baby/ seats allowed in this vehicle. Client must fit the child seat themselves. 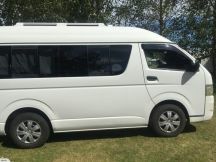 Generously designed for 2 people, its amazing that so many extras can fit into one vehicle, but with the Freedom Path Seeker campervan, travelling New Zealand could not offer more comfort or freedom. 2009/2010 Ford Transit.This vehicle is certified self contained. Can freedom camp in designated areas. Based on the Volkswagon, this HiTop Campervan is one of our most popular vehicles - and it's easy to see why. Creative design and clever use of space means 2 - 3 people can travel and live in total comfort, also enjoy the economy and ease of an engine running on diesel with manual transmission. 2007 Models. This vehicle is certified self contained Can freedom camp in this motorhome in designated areas. 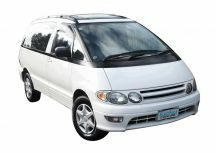 Travel in comfort with the Sweet As 2 berth (2005 Toyota Hiace), 2000cc petrol, automatic camper with air conditioning (front and rear). A porta toilet fits in the cupboard under the fixed comfortable double bed (no folding up bed each morning!). Comes with outdoor furniture table and 2 chairs as part of the package and a solar shower. A tent can be hired for extra space. The solar panels on the roof runs the fridge and the lights. With addition of the inverter, there is no need to be plugged into 240v mains power as the house battery is large and the solar panel maintains the house battery. Inverter can charge lap tops or use a hair dryer etc. Yes - This Campervan is certified as Self Contained. The Lucky Rookie is a compact, easy to drive campervan with a great sound system. Sleeping two adults, its a great way to see New Zealand. Toyota Estima or similar aged 1997 - 1999 (new Camper Fit-out late 2007). This vehicle is NOT certified self contained. You are viewing page 3 of 28.